These are soft and gooey inside. Serve them with after-dinner coffee, or turn them into a stunning dessert with slices of fresh orange, crème fraîche, and more coffee syrup drizzled over the top. Make the syrup. Put the sugar in a pan with 100ml water. Heat gently until the sugar dissolves, then bring to the boil. Boil for 10-12 minutes until deep amber. Remove from the heat and carefully add the espresso (it will spit). Return to the heat and cook for 5-6 minutes until you have a thick syrup. Cool completely. You'll have more syrup than you need for this recipe - try it with ice cream. Preheat the oven to 120°C/gas ½. Line two baking sheets with baking parchment. Whisk the egg whites until stiff, then gradually add the sugar, whisking well between each addition, until you have a thick, glossy meringue. Fold in 3 tbsp of the coffee syrup, allowing it to marble through the mixture. Spoon 6 large mounds of meringue on to each tray, spaced well apart. Bake for 1 hour. 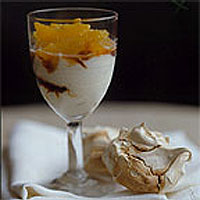 Don't open the oven, but switch it off and leave the meringues inside to dry overnight.